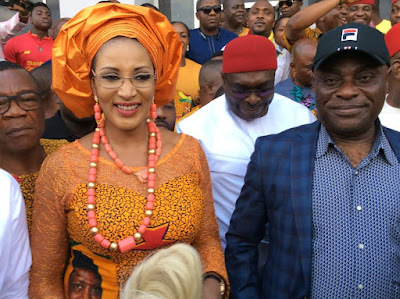 A Board of Trustees' member of the All Progressives Grand Alliance (APGA), Amb Bianca Ojukwu has frowned at the recent happenings in the party as regards the just concluded primary elections. In a statement released on Sunday through her official Facebook handle, the wife of late Biafran warlord described the primary elections conducted by APGA as "monumental embarrassment". She therefore warned that the party is currently facing "existential threat." "The recent primary elections conducted by political parties across the nation were nothing short of a monumental embarrassment for our beloved party APGA (All Progressives Grand Alliance) for its failure to organise and superintend over a credible process, an indictment which has inflicted on it heavy injuries, the nature of which many keen observers are beginning to doubt are survivable. Judging by the alarming turn of events in Imo State, it is clear that the centre can no longer hold. Our party is imperiled. This is without doubt APGA’s darkest hour. "​At no other time in the sixteen years that I have been a member of this great political movement have we, in the course of routine primary exercises witnessed such despicable levels of violence, vote rigging and other unwholesome practices, not to mention the wholesale importation of terror by political desperados intent on hijacking the electoral process at all costs. As an aspirant vying to represent Anambra South Senatorial zone, I was both a witness to, and a victim of the gross irregularities, intimidation of delegates, excess voting and the state of siege and violence which held sway at many voting arenas. The venue of my zonal primary election, Ekwulobia Stadium was literally turned into a theatre of war with several busloads of armed hoodlums invading the venue, firing sporadic gun shots, terrorising delegates with police firing teargas cannisters in order to repel their assault. As might be expected, there were several casualties. ​"I experienced through each stage of this process the living hell that the ordinary members of this party go through in a quest to fulfil their political aspirations. This process turned out to be, for most of us, nothing other than a series of transactional arrangements with the prize going to the highest bidder. At every stage there was a concerted subversion of the democratic process with the active connivance of party officials. "In many instances, most especially in Imo and Anambra states, no primaries actually took place, but candidates were simply hand picked and issued certificates of return. In my own case, I petitioned the Party’s National Assembly Electoral Appeal Panel pointing out the gross irregularities inherent in my primary election and demanding a cancellation of the exercise in line with the provisions of the Electoral Act 2010 and the APGA electoral guidelines for the Primary Elections based on the fact that the total number of votes cast at the voting arena, were more than the total number of accredited delegates, a situation which ordinarily should nullify the process but I received no response. I later discovered that a brand-new result sheet was created for my opponent ostensibly to eradicate the discrepancies and irregularities I had highlighted in my petition. "There is a huge public outcry about the impunity taking place in the party today with serious threats of an imminent mass exodus of outraged members to other political parties if these issues are not addressed. As a foundation member of this great party and wife of Dim Chukwuemeka Odumegwu-Ojukwu who gave his all to ensure that this party remains a credible and ideologically focused platform for our people to achieve their political aspirations, I am dismayed at this turn of events. This is NOT the APGA we used to know. As a member of this party’s Board of Trustees, I am deeply concerned that mercenaries would appear to have hijacked the operations of our party machinery. APGA is today facing an existential threat and the overall image of our party is in tatters. This will certainly have serious repercussions going into the main elections. "​I would like to use this opportunity to reach out to all aggrieved members and aspirants who, like myself, have suffered grave injustices under a system which had an abiding responsibility to its members to create an enabling electoral environment, and which has refused to hold to account those officials who had a cardinal duty to promote a free and fair process but who were more concerned with exacting levies and other fringe benefits. Our harrowing experiences, through this process, have exposed to all and sundry the fault lines of this party and the basic truth that APGA cannot endure unless we do something dramatically different. "We must reclaim the soul of this party. To remain neutral in this endeavour is to take sides with the status quo. We must all refuse to abandon APGA to emergency cashiers and political adventurers who would appear to have hijacked this party, and who neither understand its essence nor subscribe to its ideology. We, the real members of APGA who fought so valiantly will prevail in the end. "​I wish to express my immense gratitude to the army of tireless and dedicated individuals who worked on my campaign, to the relentless foot soldiers who trumped with me across the various communities in Anambra South Senatorial Zone, to my indefatigable media team and to my supporters and sympathizers for their commitment to a greater cause. We fought hard but were stopped by forces within this party that were not comfortable with the prospects of my emergence, but God will vindicate the just. Most of all, I am immensely grateful to our Almighty God who saw us through this process and I urge you all not to lose hope. Our task has just begun."